Are you looking for a Lights Under Louisville discount or coupon? Are you looking to go to Lights Under Louisville but want to save a few dollars? Here are Lights Under Louisville discount and coupon options for this popular holiday attraction. What’s so special about Lights Under Louisville? According to their website…………. Over 3,000,000 points of light! 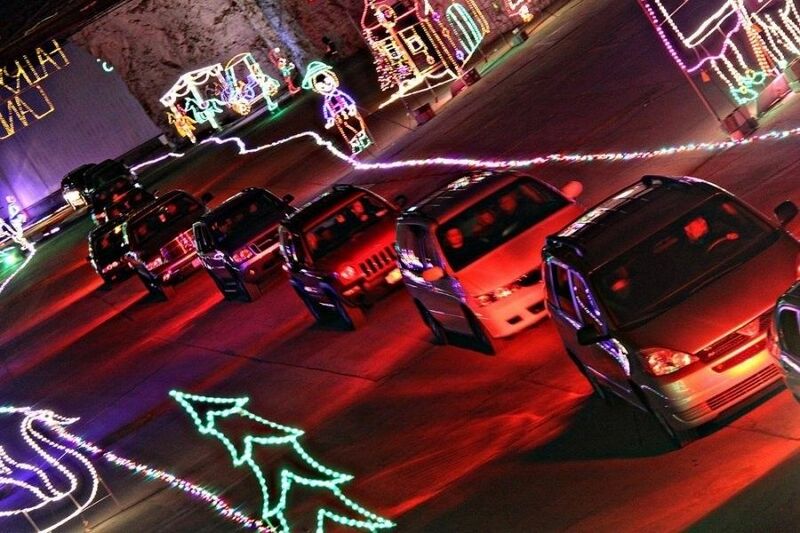 Lights Under Louisville at the Louisville Mega Caverns is $27 per vehicle! Cash/check only. Click here to see prices for vans/limos/motorcoach etc. Click here for a $5 off Lights Under Louisville discount coupon. (Read the coupon carefully, it excludes some dates) You can print the coupon or show it on your phone at the gate. $5 off coupons are also available at Kroger! Fast pass is also available if you want to pay more and skip the line. New for 2018 – Christmas Express! 30 minute day time drive through the light show in an open top trailer. This is followed up with a magical journey to our Winter Wonderland where we will serve milk and cookies to the kids. Various times throughout the entire week. Christmas Express is separate from the traditional Lights Under Louisville drive-through Experience. Click here for a link to the printable coupon online from Val-Pak. Click here for more family fun this winter!